We, at Restaurantware aim to provide you the trendiest options for your restaurant, café, food truck, catering business, or dinner party. However, we also strive to offer you eco-friendly products, so you worry less while running your establishment. We ensure these are environmentally friendly by using premium, sustainable material. Also, all Restaurantware items are recyclable, biodegradable, or reusable and reduce your and our carbon footprint on our surrounding environment. Serving customers from an environmentally friendly restaurant is vital because taking care of our world will only affect our present and future positively. Our products reduce the amount of trash piled up in landfills because you either recycle or reuse them, or they decompose into the earth easily. You make the right choice if you use eco-friendly products because you will be helping our natural world, and your customers will notice your efforts. Not only do you take pride in presenting your food fashionably, but you also try to reduce your impact on the environment we all share. Our recyclable, biodegradable, and reusable products are the best choice for environmentally sustainable merchandise because our main focus is you when we craft our innovative pieces. At Restaurantware, we create each product not only environmentally friendly, but also stylishly, durably, and multi-functionally. Our vast collection offers you a variety of choice depending on your specific needs. We are also constantly adding more products, so our selection is only growing. We also deliver your sustainable tableware and flatware right to your door, so you never have to rush around town trying to locate what you need. Our company maintains the smallest possible carbon footprint while we commit to help our customers preserve the same standards. We all need to keep our futures in mind while living in the present, and using environmentally friendly products only helps improve our upcoming generations. Restaurantware’s commitment is to help you present your food modernly and fashionably, while also making it easy to limit your overall impact on our world. We use only high quality, sustainable material in all of our products. This guarantees that our recyclables give back to the world, our biodegradables compost easily, and our reusable goods last as long as possible. Using our eco-friendly line reduces our customers’ stress and worry about negatively influencing our environment. Striving to be green at your establishment makes a difference for your guests because it shows that you are aware of your surroundings. Customers will appreciate your efforts to improve our planet. Restaurantware’s collections impact our environment in a variety of ways. No matter what product we offer, we always make sure it helps our world in the end. However, we know that not all materials can be recycled or biodegradable. To solve this issue, we create reusable lines, made with the highest grade resources, as durable and long-lasting as possible. The longer you use a product, the less waste you produce for our landfills. Overall, our products are environmentally productive – whether you recycle them, they compost easily into the earth, or reuse them for years. Reducing carbon footprints is a team effort, and we are your teammate. We use only high quality, sustainable material in all of our products. This guarantees that our recyclables give back to the world, our biodegradables compost easily, and our reusable goods last as long as possible. Using our eco-friendly line reduces our customers’ stress and worry about negatively influencing our environment. Striving to be green at your establishment makes a difference for your guests because it shows that you are aware of your surroundings. Customers will appreciate your efforts to improve our planet. Restaurantware’s collections impact our environment in a variety of ways. No matter what product we offer, we always make sure it helps our world in the end. However, we know that not all materials can be recycled or biodegradable. To solve this issue, we create reusable lines, made with the highest grade resources, as durable and long-lasting as possible. The longer you use a product, the less waste you produce for our landfills. Overall, our products are environmentally productive – whether you recycle them, they compost easily into the earth, or reuse them for years. Reducing carbon footprints is a team effort, and we are your teammate. 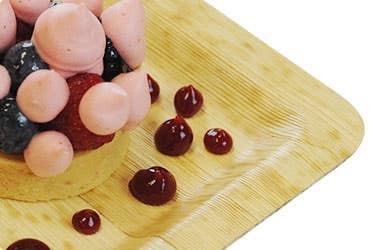 Restaurantware impacts our environment friendly by offering our main three selections: recyclable, biodegradable, and reusable. Each of our collections have various functions for different settings. Together, they provide our customers with many different options to go green. We make it easy and affordable for companies to reduce their carbon footprint, guaranteeing that our planet and our clients are happy. The recyclable collections includes our plastic tableware and flatware. We offer products made with premium material in various styles, sizes, and colors. You can find pipettes, bowls, cones, stands, cups for food and beverage, cutlery, glasses, lidded items, plates, and shot glasses. Plastics are convenient and affordable for any restaurant. Our high-grade material ensures that our plastic-ware is strong enough for any situation. All of our plastics are recyclable, and will continue to be made into different products. This helps our environment because our waste amounts drastically reduce when recycling is a priority. Our biodegradables are easily compostable, highly affordable, and modernly fashionable. 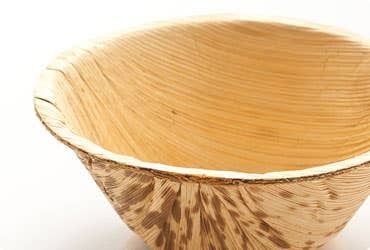 We offer products made of bamboo, wood, and paper that are 100% biodegradable. Our bamboo collection is made with high-end organic bamboo material, specially selected for our selections. 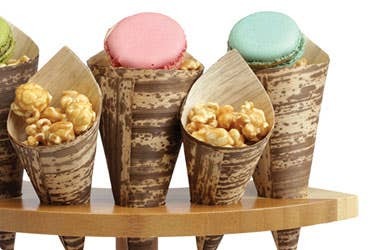 This material adds an innovative flair to any table. Our biodegradable wood assortment is made of premium organic resources. We offer a variety of different woods – including pinewood, poplar, and birch. Each style can add a different personality to your dishes. Lastly, our paper products are made of easily compostable material. Our paper collection is colorful, durable, and functional. This includes a variety of merchandise aimed to add a certain flair to your atmosphere. Reusable products are a staple in many different food establishments, and we offer top-notch porcelain, metal, and glass. We offer a broad range of reusable tableware and flatware to meet your specific needs. Our porcelain collection is made of the highest grade material and adds an elegance and beauty to any setting. Our reusable merchandise lasts long, so you and your customers remain happy. Our metal assortment includes a variety of tableware and kitchenware. We use very durable material to create these items to ensure that they will last in your restaurant and kitchen. Not only is the metal collection highly functional, but they are also classy and chic. Our glass selection is made of top-notch and dependable resources. These are very strong to ensure their longevity. Additionally, we offer a vast variety glasses and bottles for many different scenarios. Together, our porcelain, metal, and glass products are the strongest line available. Reusing these items will only reduce your impact on the environment, helping you and your business go green.